Alfred Bachmann, pair of oil on panel Venice Views, circa 1890-1910 A lovely subject that this excellent German painter offers us, a pair of oils on panels in their original giltwood frames, depicting with a superb palette of colors, two Venice Views late 19th century or early 20th century. 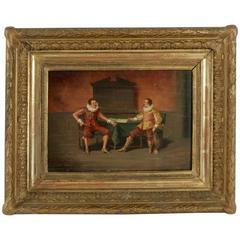 Fine original condition, on its original panels, and its original gilt wood frames. Dimensions unframed: W 12.59 In. - H 7.4 In. Dimensions framed: W 19.29 In. - H 13.77 In. Alfred August Felix Bachmann (1863-1956): German painter, born 1st October 1863, in Dirschau, near Danzig (now Gdansk, Poland); died 1956, in Ambach. Painter of landscapes with characters, landscapes, seascapes, and orientalism. Alfred Bachmann studied at the art academy in Königsberg (now Kaliningrad, Russia) in the former eastern Prussia. He settled in Munich in 1891. Fine original condition, on its original panels, and its original gilt wood frames. Antique oil on canvas painting of Venice with the original gold leafed frame. The image represents the Castello neighborhood in Venice. Framed French oil on canvas painting of flowers, circa 1910. Please note this item is an antique and is one of a kind.